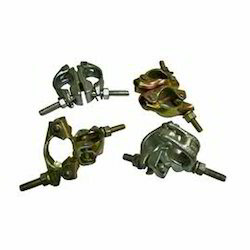 With profound knowledge of the demand of our clients, we manufacture, supply and export superior quality Truss Scaffolding Clamp in distinctive range of sizes ideal to use with reliability and assurance. 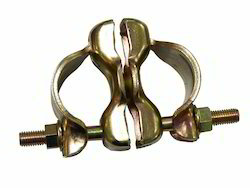 We manufacture these clamps with impeccable quality of raw materials rooted from reliable vendors of the market. Backed by a rich industrial experience, we are engaged in bringing forth a comprehensive variety of MS Scaffolding Clip. Scaffolding Beam Clamps manufactured using advanced technology that incorporates a floating 4 way abutment and locking of adjacent panels . Clamps are adjustable in nature and secure clamping device for steel as well as timber form-work for column. Quickly adjusted and locked to ensure clamping of steel and timber formwork for concreate columns. » Save time, Labour and Wastage. » 3 Sizes of arm are interchangeable and suit both square and rectangular sections . » Flexible, Galvanised wires avoid broken chain and lose wedges. "Double clamp Dia : 48.3mm Weight: 1.-1.03kgs"